Quite an accomplishment, Thrane & Thrane announces that the 10,000th SAILOR FleetBroadband terminal has been shipped to Certified Partner Telemar, just two and a half years since Inmarsat's revolutionary FleetBroadband service went live. The 10,000th SAILOR FleetBroadband terminal incorporates a 19" below-deck unit (BDU) and has been shipped to Certified Partner and system integrator Telemar for installation on board a Rickmers Shipping Company vessel. SAILOR 500 FleetBroadband systems will be used on over 100 Rickmers vessels to integrate and manage the company's communications and networking infrastructure. The system architecture has been designed to be 'future-proof', with an integrated and scalable set-up to allow for flexibility in meeting future requirements. Rickmers also intends to utilize the system to pursue continuous optimization and enhancement goals, potentially including further technological options available in the future. Commenting on Rickmers selection of Telemar to install and integrate the SAILOR FleetBroadband terminal Bruno Musella, Managing Director of the Telemar Group said: "Rickmers has selected Telemar for its unique value of integration and management of all communications and networking needs. This adds further value to the important customer experience to upgrade to a SAILOR FleetBroadband system. Rickmers appreciates the distinctive global servicing network offered by the Telemar group, which is present in all main shipping ports and have daughter companies in 10 markets. Telemar Germany is probably the fastest moving provider in the German market. It combines great knowledge of the market by the local management and the integrated service portfolio of the group. Our group is proud to be able to serve such a big and prestigious ship owner." 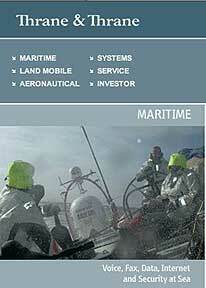 "SAILOR FleetBroadband has struck a chord with the maritime communications industry and the end user. The diversity of the product portfolio has helped to establish SAILOR as the FleetBroadband terminals of choice regardless of the size or type of vessel," comments Jens Ewerling, Product Line Manager, Maritime Satcom. Thrane & Thrane was first to market following the launch of the Inmarsat FleetBroadband service in November 2007, with the SAILOR 500 and 250 FleetBroadband terminals. The June 2009 launch of SAILOR 150 FleetBroadband expanded the portfolio, which now offers a terminal for all vessel types from small yachts and workboats through to offshore vessels, tankers and merchant ships.